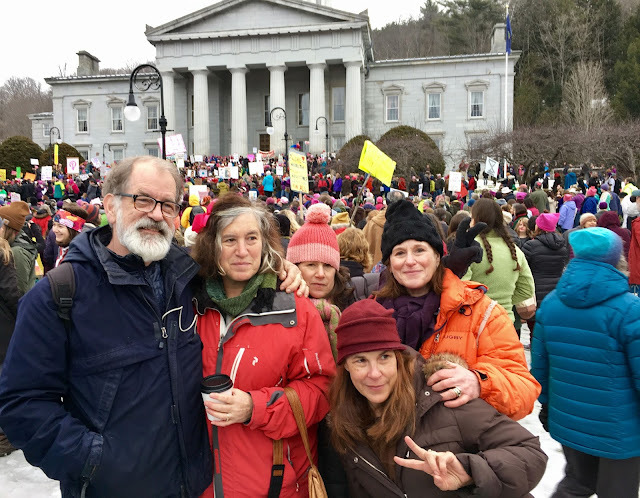 On the day after the inauguration of the 45th president of the United States, I (the one in the weird black hat) was proud to be among the millions participating globally in the Women's March. Why? I stand together with other individuals and organizations committed to equality, diversity, and inclusion ... and with those who understand that women's rights are human rights; that climate change is real; that U.S. public schools are not a "dead end." I stand against defunding Planned Parenthood so that all women have access to feminine healthcare. The potential banning of all Muslim immigrants is not just. And funding cut and curbed for the National Humanities for the Arts and the National Endowment for the Humanities? At what cost? The challenge now is to keep our voices heard as new policies in education, medicine, the arts, and women's rights threaten to bring us back 50 years. Below: Women's March (15,000 strong!) at the State House in Montpelier, Vermont. Fabulous! I was there in spirit and support for all. Thanks, Paula. We felt your presence for sure.